Tonight everything has changed in the hamburger world. Every time I attempt to have any type of burger I’m stuck with the plain burger and no bun. Tonight, everything’s changin! 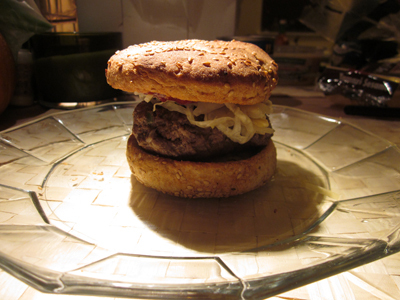 My excitement about this new GF hamburger bun (that’s actually not filled with total junk) is soaring high! 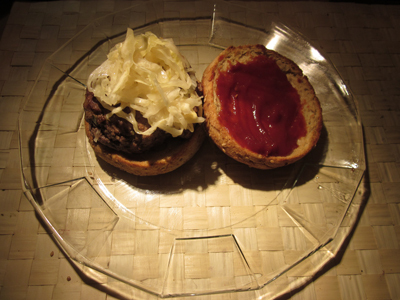 On this fine night we decided to make grass-fed ground beef burgers and as we walked around Whole Foods we actually came across gluten free hamburger buns! If only you could have seen the excitement in my eyes as we quickly threw the package into our cart. I’ve never been so happy about a hamburger bun before and boy was it worth every bit of hype. You see, I’m always the girl who makes sure her burger comes without the bun, not because I’m watching my carb intake, but because my body can’t tolerate the gluten that’s in the buns! Please check out Canyon Bakehouse for an incredible (healthier then all the rest) surprise. We were so hungry when we got home from the market that we couldn’t wait to start cooking immediately. I grabbed the ground meat, scallions, garlic powder, cinnamon and lime and prepared myself to make the best kickin’ burger around town. The cinnamon gave it the most incredible hint of sweetness. According to Chad, we made the best damn burger that he’s had in NYC! Start by removing your meat from the package and place it into a mixing bowl. Chop your scallions using the green and white parts and add them in with the meat. Then add your garlic and cinnamon and mix together. Make your patties and set them aside on a separate platter. Place a frying pan on the stove and pour in your olive oil. Heat on high until the oil is hot, then lower to a medium flame. Place your burgers in the pan and let cook, flipping when needed so both sides cook evenly. Take the lime and sprinkle some juice over each side of the burgers. Sprinkle some extra cinnamon on each side as you flip the burgers. Cook until desired and place on a plate with paper towel to soak up any extra oil. Load up your burger and enjoy! Last week I was at the farmers market buying my organic veggies when I came across this seller named 5 lbs of Dirt. Have you heard of them?? They sell purely organic produce, although I’m not sure they’re certified organic but they don’t spray any chemicals whatsoever and they are truly a gem. Look for them at Union Square or 79th and Columbus on Sundays. The two most incredible products that I’ve gotten from them were watermelon radish, which was so tasty and beautiful in color that I just wanted to scream! 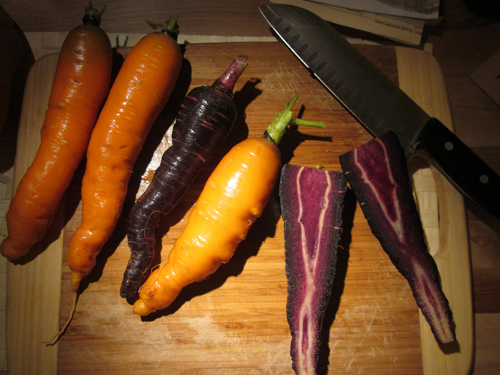 I also bought heirloom carrots, yep, you heard right, heirloom carrots! They were purple!! Luckily I did manage to take some pictures of them. 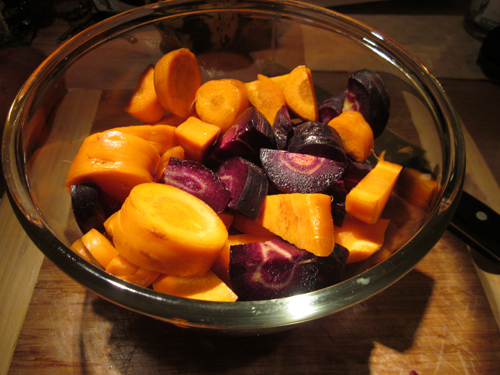 I made a carrot ginger soup that came out a purple/red color. 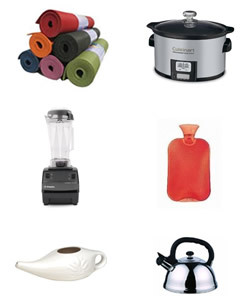 You will find unbelievable freshness from these guys. They are friendly and are usually giving out samples of their delicious veggies. Please check them out – they might not have a sign out in front but their mode of transportation is a bus – you can’t miss them. You can find them on Facebook to see what they have in store for us this coming week at the market. Heirloom carrots! The uglier they are, the more tasty they will be! Watermelon Radish – so beautiful! What to Eat for Din Din? Have you ever been walking through the supermarket asking yourself what you can possibly make that will be easy, quick, delicious and healthy for dinner?? I’m sure there have been times where your stumped to come up with a good meal and you either end up buying something frozen, ready made or simply ordering in from a local restaurant. Well, I know exactly how you feel. Recently I’ve been struggling with what to have/make for dinner! I like to shop at the farmers market so I usually have some veggies lying around – but veggies are just boring if you aren’t creative in how you prepare them. When I’m not in the mood for animal protein and don’t want to load up on soy I usually find my way eating veggie protein. Last night was one of those instances and I found myself scrounging up any and all veggies that were in the fridge. 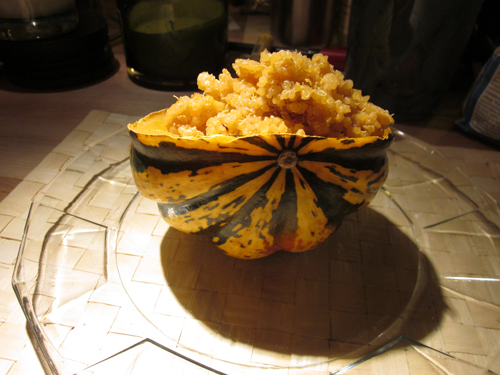 I came up with a squash bowl with quinoa and root vegetables and it was YUMMY. The point I’m making here is that even if you look in your fridge and think there isn’t anything good in there, look again and try to be creative with what you already have. I really hate wasting food and was so happy to use up my delicious organic veggies. I saved money doing it and had a delicious dinner filled with plenty of protein. 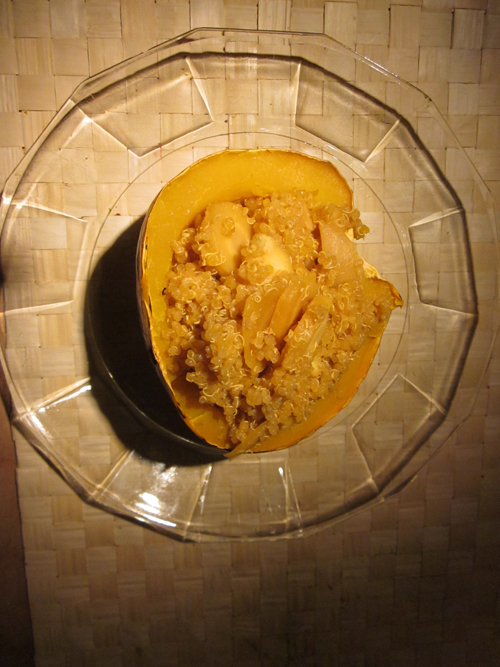 Cut your squash in half and scoop out the seeds. Put a cup of water in the bottom of your baking dish and then place the squash face down and roast for half hour. Test the squash by inserting a fork, it should be soft. Rinse and wash the quinoa and cook as instructed by the package you use. Next place your pan on the stove and heat up the oil. Slice the root veggies and place them into the pan. Add a small amount of water to the pan so the veggies can cook evenly. Squeeze one whole lemon over the veggies and sprinkle with tamari soy sauce and stir. Cover the pan and cook for about 20 minutes until veggies are soft. Mix the veggies with quinoa and fill the squash bowl with this delicious mixture and serve. Enjoy!